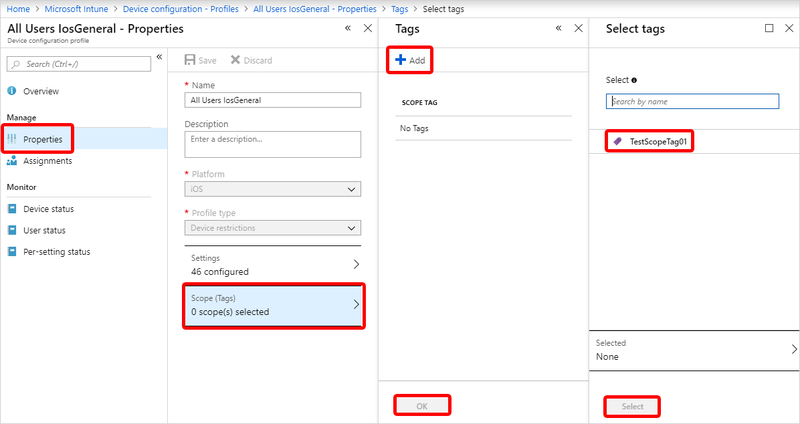 You can use role-based access control and scope tags to make sure that the right admins have the right access and visibility to the right Intune objects. Roles determine what access admins have to which objects. Scope tags determine which objects admins can see. Create a scope tag called Seattle. Members (Groups) = A security group named Seattle IT admins. All admins in this group will have permission to manage policies and profiles for users/devices in the Scope (Groups). Scope (Groups) = A security group named Seattle users. All users/devices in this group can have their profiles and policies managed by the admins in the Members (Groups). Scope (Tags) = Seattle. Admins in the Member (Groups) can see devices that also have the Seattle scope tag. 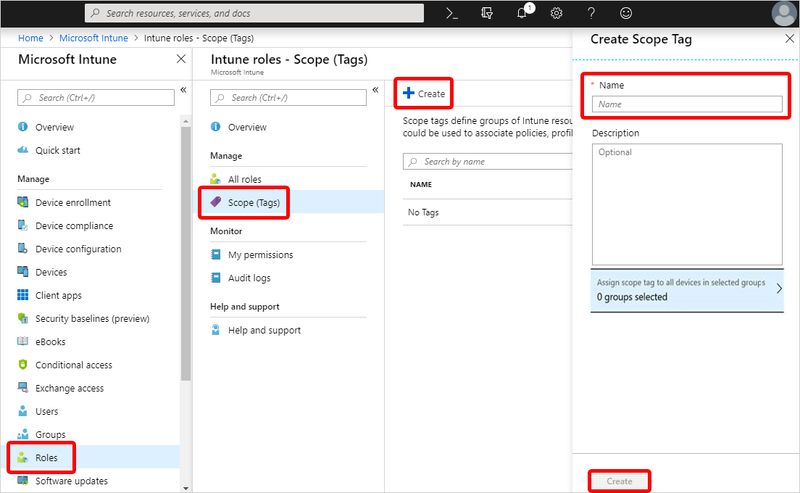 Add the Seattle scope tag to policies and profiles that you want admins in Members (Groups) to be able to access. Add the Seattle scope tag to devices that you want visible to admins in the Members (Groups). 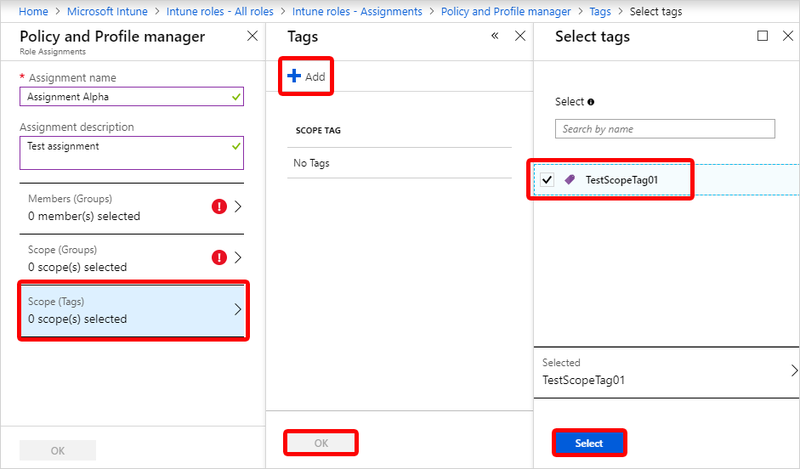 In Intune, choose Roles > Scope (Tags) > Create. In Intune, choose Roles > All roles > choose a role > Assignments > Assign. 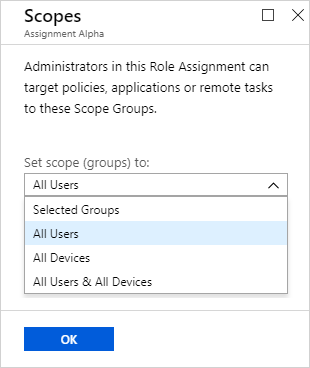 Choose Members (Groups) > Add > choose the groups that you want as part of this assignment > Select > OK. mUsers in this group will have permissions to manage policies and profiles for users/devices in the Scope (Groups). 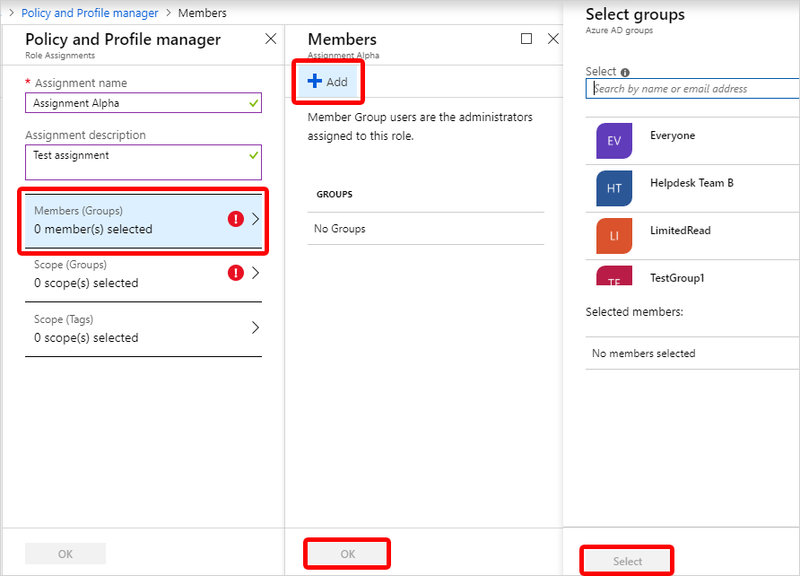 If you want to manage users/devices in a specific set of groups, choose Scope (Groups) > Selected Groups > Select groups to include > choose the groups > Select > OK. All users/devices in this group can have their profiles and policies managed by the admins in the Members (Group). Alternately, you can choose All Devices, All Users, or All Users & All Devices. 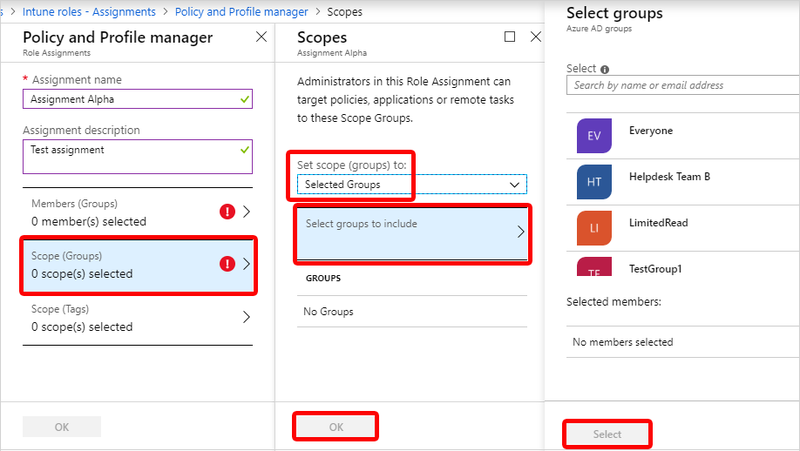 Choose Scope (Tags) > Add > choose the tags that you want to add to this role > Select > OK. Users in Members (Groups) will have access to the policies and profiles that also have the same scope tag. In Intune, choose Device configuration > Profiles > choose a profile. Choose Properties > Scope (Tags) > Add. Under Select Tags, choose the tags that you want to add to the profile. Choose Select > OK > Save. Choose Client apps > App configuration policies > choose an app configuration policy. Choose Properties > Scope (Tags) > choose the tags you want to assign to the policy. Choose Scope (Tags) > choose the tags you want to assign to the policy. In Intune, choose Client apps > iOS app provisioning profiles > choose a profile. Choose Properties > Scope (Tags) > choose the tags that you want to assign to the profile. In Intune, choose Client apps > Apple VPP tokens > choose a VPP token. Select Scope (Tags) > choose the tags that you want to assign to the profile. The VPP apps and ebooks associated with the VPP token inherit the assigned tags. When an admin creates an object in Intune, all scope tags assigned to that admin will be automatically assigned to the new object. Intune RBAC doesn't apply to Azure Active Directory roles. So, the Intune Service Admins and Global Admins roles have full admin access to Intune no matter what scope tags they have. Administrators in a role assignment with scope tags can also see Intune objects with no scope tags. You can only assign a scope tag that you have in your role assignments. You can only target groups that are listed in the Scope (Groups) of your role assignment. If you have a scope tag assigned to your role, you can't delete all scope tags on an Intune object. At least one scope tag is required. Manage your roles and profiles.